Welcome to my life...: Space Needle FUN! The day after my brother and his wife got here we decided to go to Seattle for the day. It was a lot of fun and definitely a lot of laughs! I was super excited because C has never been to the top of the Space Needle. We get there and we didn't have to wait too long. We waited less than 10 minutes for our turn to go up to the top! The elevator ride is pretty scary if you are scared of heights. With glass walls you can see it all as you go up! C was pretty nervous and held onto her Paran Derrick really tight. She looked out this time. When we got up there she stayed more towards the inner wall instead of looking out. 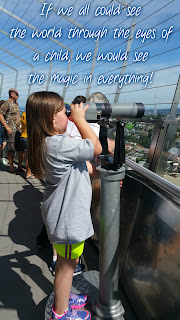 She did however LOVE the look out telescopes and looked through every one of them. It was super cute. 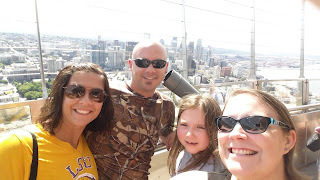 Here is a picture of the 4 of us before we headed down! She did however decide to ride the elevator the opposite way so she did not have to look out the glass walls. She did fine. And it was a fun experience for us all! I think my brother and his wife enjoyed it. The hardest longest 14 days of my LIFE!